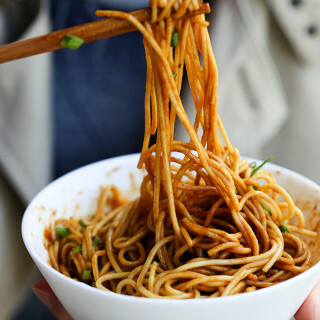 Famous in China wuhan style hot sesame noodles—hot and dry noodles. 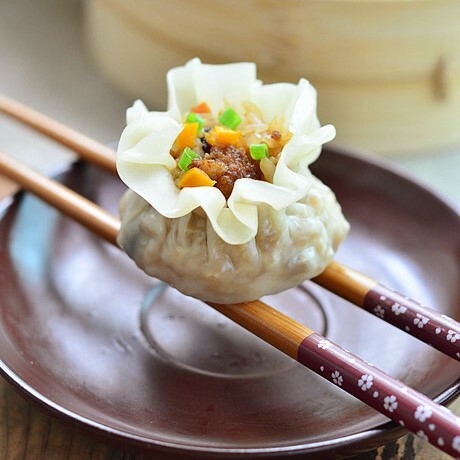 There are so many yummy Chinese noodles dishes, presenting in soups, fried noodles and noodle salad. This one is originated from Hubei province, where my husband was born. 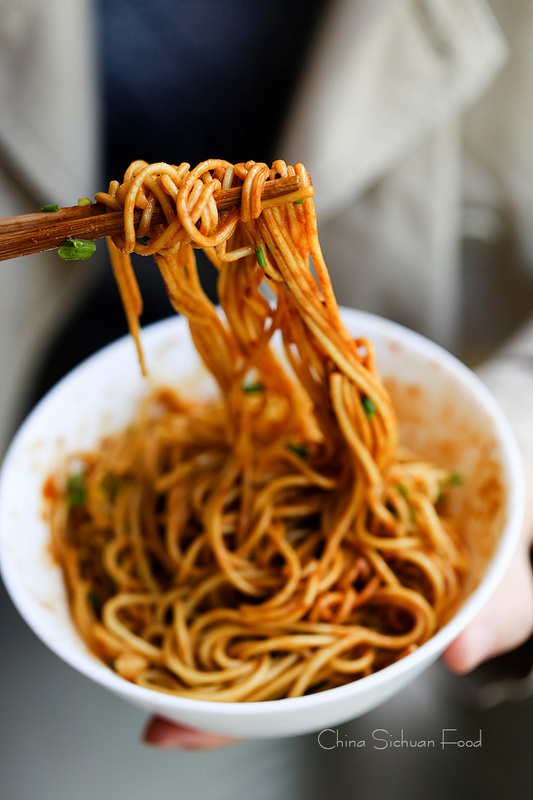 It is considered as one of the most ten famous noodles in China officially. 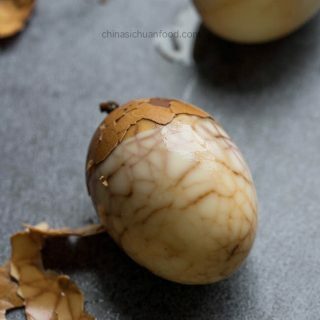 Just for information, the other nine ones are Beijing fried sauce noodles, Knife cut noodles, Henan stewed noodles, Lanzhou hand pulled noodles, Hangzhou Pian’er noodles, Sichuan Dan Dan noodles, Kunshan Aozao noodles, Zhenjiang Pot Cover noodles (锅盖面) and Jilin cold noodles. Those ten most famous noodles are officially selected from more than 3000 types of noodles. But eaters have their own ranking. 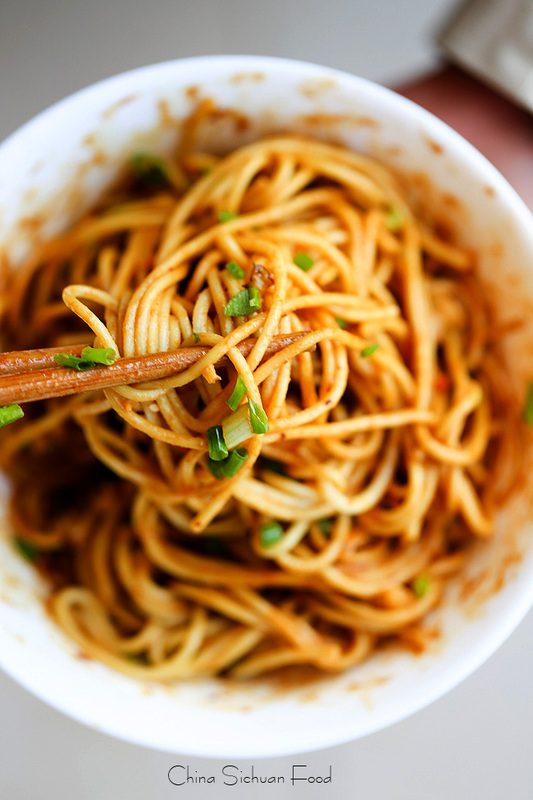 Wuhan noodle is known as Hot and Dry noodles (热干面) in Chinese, mainly describing the texture. The main seasoning is tuned sesame paste. 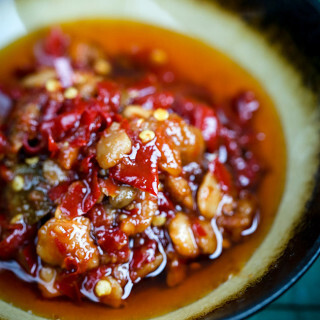 And usually we top with picked spicy radish also from Hubei (酱萝卜) and sometimes pickled long Chinese green beans. During every Spring Festival, we spend the holiday with my husband’s parents. And our favorite breakfast is a bowl of hot and dry noodles just under our building. 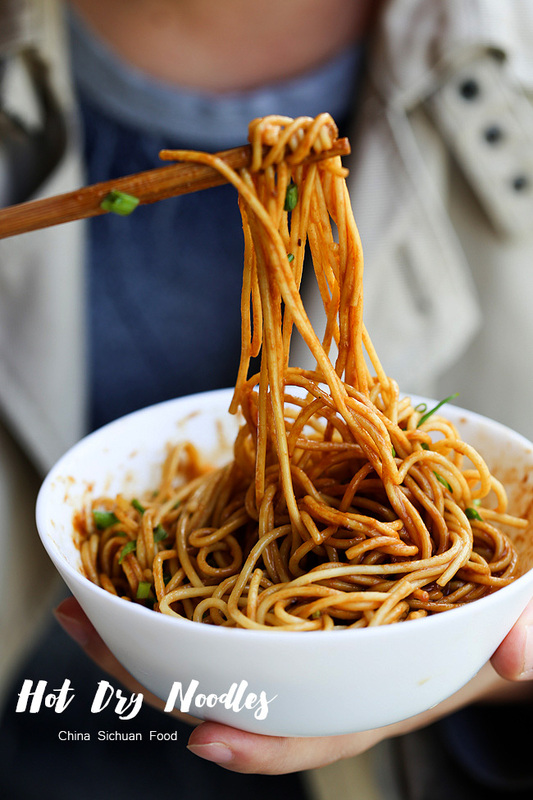 This noodle seems quite simple, but the ratio and the texture of sesame paste is a key step. If the sesame paste were too dry, it would be quite hard to combine. However too much water will make the noodles not dry at all. Sesame paste should completely stick to the noodles. We have Sichuan style cold noodles (凉面) using very similar ingredients and seasonings. But with different seasoning ratio, the noodles present different tastes. 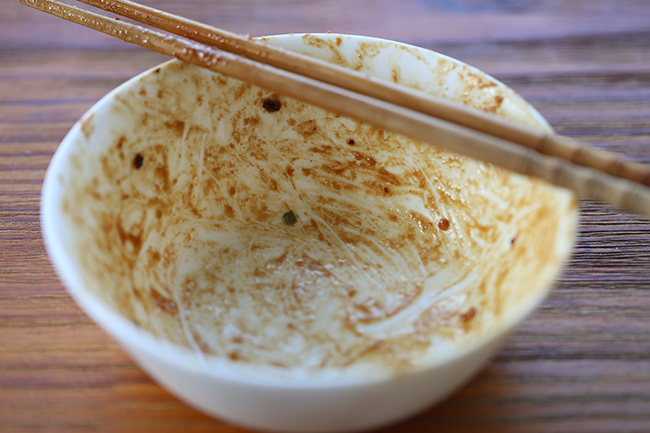 When finishing, there should be no sauce left in the bowl. The noodles called for Wuhan noodles is called alkaline noodles(碱面). Alkaline noodle is less time-sensitive and quite popular in Szechuan province too. It can be replaced by spaghetti if unavailable. 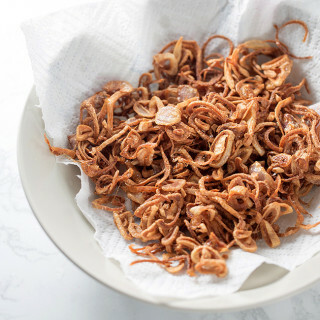 Cook the dried noodles for 4-5 minutes or fresh ones for 3-4 minutes. Transfer out and drain. Place the noodles to a clean operating board, add sesame oil and combine well. 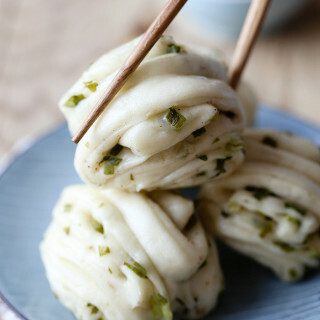 This process can cool down the noodles quickly and creating a chewy texture. Set aside to cool down completely. In a large bowl, first mix 2 tablespoons of sesame paste with 1 tablespoon of sesame oil. Stir until well combined. And then add light soy sauce and dark soy sauce, continue stirring in one direction until well combined. Add around 4-5 tablespoons of warm water by three batches. Each time after adding water, stir in one direction until all the ingredients are well incorporated. Add Chinese five spice and a small pinch of salt based on personal taste. Combine well. Mince green onion and chop the pickled radishes. You can also add smashed peanuts, pickled green beans or other toppings. Smashed 2 garlic cloves and then soak with warm water. 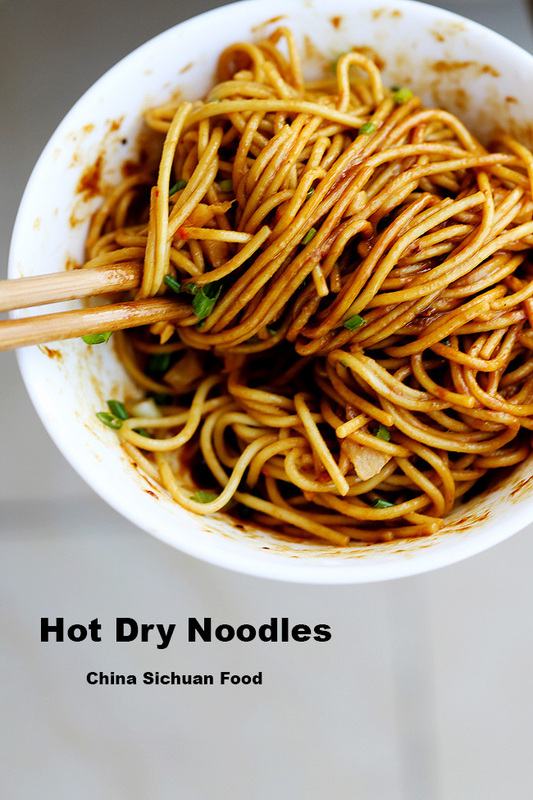 Bring water to boil in a large pot, and re-cook the noodles for around 10 -15 seconds until hot. Shake off extra water and transfer to serving bowl. 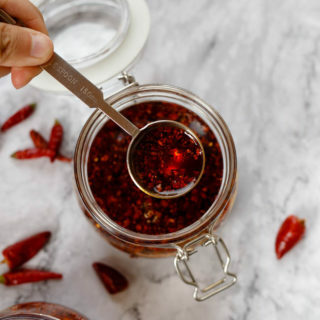 Add around 2 tablespoons of tuned sesame paste mixture, 1/4 teaspoon vinegar (optional), 1 teaspoon garlic water, 1/8 teaspoon sugar and 2 teaspoons of chili oil. Top with green onion and pickled radish. As we do not add salt directly in the noodles, it is pre-added in sesame paste. However since soy sauce has salinity, only a small amount is needed. You can boil a larger amount of noodles and cool down for later recipes. There would definitely be nothing left in *my* bowl! These noodles look wonderful. I just made this, and it was amazing! I only had fettuccine noodles, but my family still enjoyed it. Thanks for sharing! Thanks Margaret for the lovely feedback. How interesting! I’ve never heard of alkaline noodles, what does it taste like? Is the texture chewy? Yes, it is chewier and more importantly less time sensitive. I have eaten these noodles many times while in Wuhan. 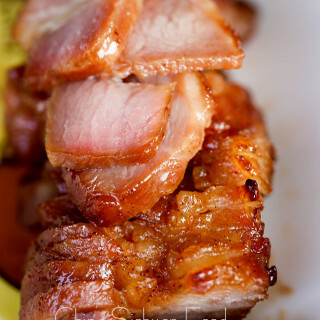 This recipe is very authentic, my wife is from Wuhan and she agrees! Thank you for sharing! Thanks Jeremiah for such a great comment. 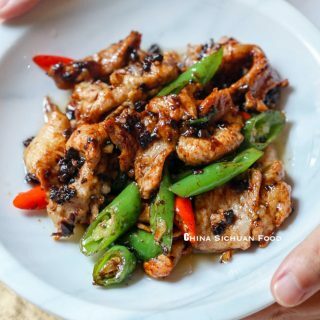 Would using normal soy sauce instead of dark and light change the taste by much? I can’t seem to find in my town anything but normal soy sauce. 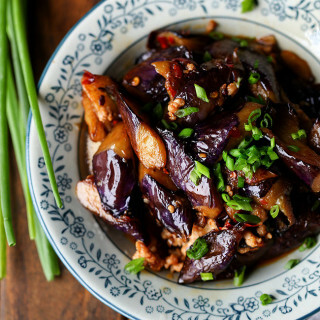 Normal soy sauce can work for this recipe too. Chinese people like noodles. I like noodles. Therefore I must be Chinese. Yep, its true, funny how that works. Why is the prep time a total of 2 hours? Does that assume you are using homemade noodles? Because we need to cool down the noodles. Why do we have to stir in one direction? Is there a particular science to it? Hi Elaine, great recipe! Quick question: what brand of sesame paste do you use? Mine seems to contain a bit more oil than what yours looks like in the video, and I cant seem to find one that has a good wet-dry balance. It is 100% ok if the sesame paste contains more oil itself. Just decrease the amount of sesame oil added in later process. I use a very popular local brand which might be quite hard to find outside China. it has been almost 10 years since i’ve last gone to my parent’s hometown of wuhan. there is a special place in my heart, though, for the breakfast foods like reganmian that you can get on the street. re gan mian being one of my all time favorites, there are also other ones that are more soupy, more spicy – i cannot remember the name! since it seems like you’re actually there, perhaps you would know? 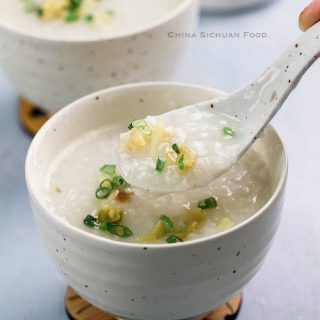 any chance you could share a recipe for other wuhan breakfast dishes as well? i also remember a whole table full of spices. the cooks would dump the noodles into a big pot of water, but only for a few seconds. they’d put it in a paper bowl, and then go along the table adding spices that you wanted. surely, there are more toppings than the ones you have listed. I am drooling when reading your comment. People in wuhan emphasis on their breakfast. My husband is from Hubei province. I will find a chance to look deeper about those yummy and delicious breakfast dishes. This is a homemade simplified Reganmian. Cannot product 100% same result and at least 80% similar.